Enchantment with my surroundings had caused me to lose track of time. This was, of course, compounded by the search for a way through the rock wall and my slowed pace due to my wonky knee. As a result, I returned to the homestead too late to say good-bye to Dorothy and Dennis, for which I was sorry. I enjoyed them both and would have liked to have wished them well and joy on their onward travels. Sigh. I headed off to hike a bit more, but by 5:30, the sun was beginning to set. I headed back to the cabin, cleaned up a bit, and then, about 6:15, I carried my tripod and camera gear out to a clearing not far from the homestead, set it up, and waited for the sunset’s afterglow. I think I got some good shots, but it’s hard to predict. My battery just died, so I had no light meter. We’ll see. At 7pm, I headed for the homestead dining room once again. With Dorothy and Dennis gone, I ate alone, but that afforded me the opportunity both to write and to admire my surroundings. I love this old building. I was also a bit saddened to overhear a couple of teenagers complaining to their parents that “there is nothing to do here.” I pity those who cannot find anything to do when surrounded by so much that is fascinating and beautiful. I again ordered the barramundi. Not sure when I’ll get to enjoy this again. For starters, I had pumpkin soup, which was lovely. I thought back to my first trip, when I had been surprised to find that pumpkin is used so widely here, appearing often mashed and served as a side dish, but also showing up in other recipes, such as the velvety soup I enjoyed. It was in Australia, on that first, long trip, that I had fallen in love with Strongbow cider, so that seemed like the perfect beverage. (They have it now in the United States, but for a long time, it simply wasn’t available here.) 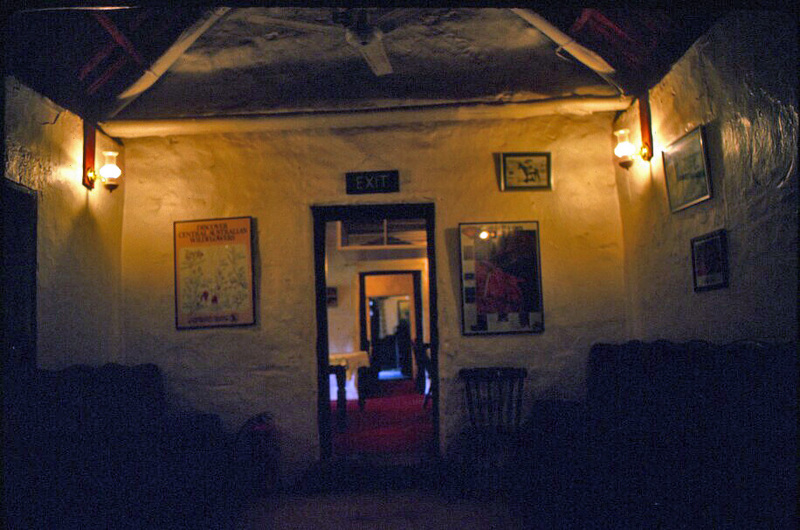 There’s something particularly appealing about eating a really lovely meal in a charmingly rustic, historic setting. I enjoyed myself thoroughly. After dinner, I went out for a bit of stargazing. 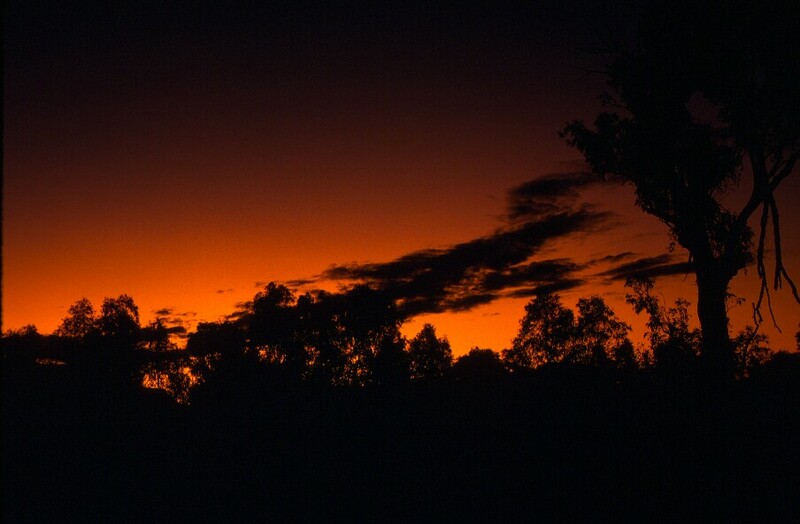 I was again awed by the beauty of Australia’s nighttime sky. I found the Southern Cross (with much joy–this constellation really delights me, no doubt because it is so associated with Australia). I spent a bit more than an hour outside, in the darkened desert, just enjoying the great, glittering show, but with my gaze returning regularly to the Southern Cross. The Milky Way sprawling across the sky is so impressive in this hemisphere, and of course, being out in the desert makes it seem closer and even more awe-inspiring. Then it was back to the cabin for some sad packing in preparation for tomorrow’s departure. I’m not sure how I allowed myself so little time here. Did I think I would not react the same to the outback as I did the first time? Could I have imagined that it would not speak to me as it had before? Had I forgotten what it meant to me? I must return, and next time, I must give myself more time. I walked west for a while, looking for a path that would take me through one large rock formation in search of another. Green and gold vegetation highlighted the deep red of the land, and the incredibly blue sky made a vivid backdrop for the rugged landscape. Before too long, I found the wall of rock roughly sketched on the map, and I walked along it, in search of the narrow passage that cut through to the other side. The passage opened out into a landscape that was essentially the same as what I’d left behind, but which was even quieter and more peaceful. I wandered happily for a couple of hours, enjoying the beauty of the place. However, my bad knee began to act up a little, so I thought it would be wise to head back before it began giving me any trouble. When I once again reached the great ridge of rock through which I’d passed, I found myself faced with a rather daunting sight. While the front of the rock wall had offered one entrance, the back of it offered dozens of possibilities. Obviously, all but one of these must be dead ends, for the front to offer such a closed face. But which chasm would take me through to the other side? Following footprints might seem like an obvious solution, but the soft soil here takes footprints and holds them until the next wind or rainstorm, which can be a long time in coming. As a result, there were numerous footprints from hikers over weeks and maybe months, clearly all faced with the same dilemma, as they went in every direction. I hoped that if I walked along the backside of the rock, I would be able to see daylight on the far end of one of the many channels. I was not panicked, by any means, as I still had half a canteen full of water, and having signed out at Ross River, I knew I’d be missed–and that they knew my direction. Still, I didn’t fancy having to be rescued, so I hoped I’d be able to make my way back on my own. Most of the deep, narrow channels were in shadow, so I didn’t know if it was possible to see through to the other side. They all looked dark and unpromising. Then, on the ground before me, I saw a familiar word printed in the red dust. I had bought new shoes for this trip, a brand I hadn’t worn before, but it appeared now that they would save me. There, amid the many nondescript tread prints was the word Reebok. I looked at the bottom of my shoe, to confirm that it matched, and then, laughing, turned to follow the word back through the correct channel. 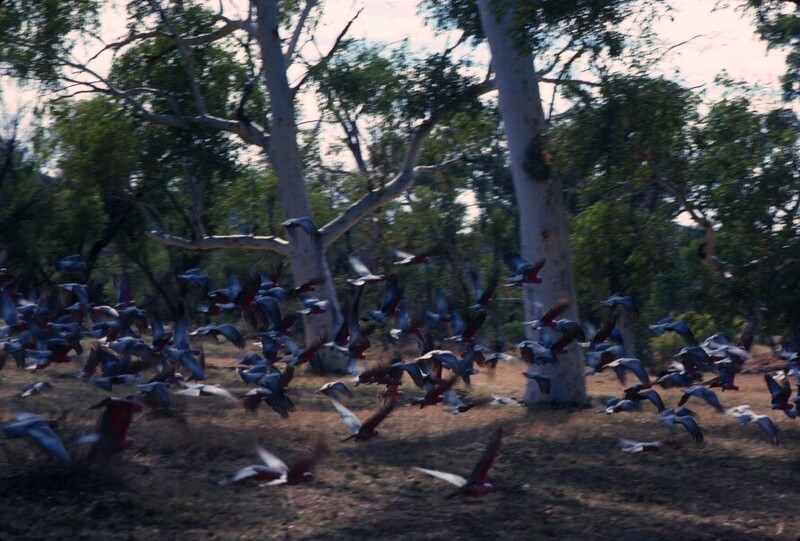 The galahs descended en masse at about 6:30 this morning, making a huge but delightful racket. No need for an alarm clock out here. The dawn was lovely. It was quite cool this morning, so it’s necessary to dress differently during the early hours than at noon. At breakfast, I struck up a conversation with a delightful woman, Dorothy, from Melbourne, who is in her late 60s, but sharp and fit. She has, of course, seen even more changes in Australia and the world than I have, and we talked about the non-improvement we felt much of this “progress” was brining in some areas. We discussed literature, economics, travel, and much more. Together, we wandered down to where Alec was boiling the billy for morning tea and preparing a new batch of damper (a simple bread cooked in a camp oven buried in the coals). Dennis, the young man from Ireland, joined us for a while, and we talked of the world and how our wandering had brought us all here. Eventually, we parted company, and I went on a horse-drawn wagon ride, to view a bit more of the area around the homestead. There is very little traffic out here, but even so, cars passed by a couple of times. I was greatly impressed with the superiority of traveling by wagon. It suits the place. I walked for about an hour after the wagon ride, wandering through the splendid red landscape. Trees and shrubs thronged both dry creek beds and the occasional waterhole. 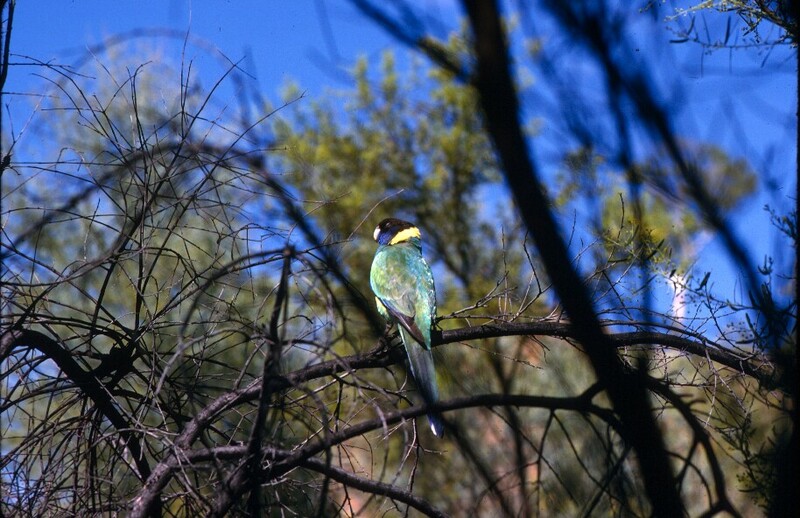 The branches were more often than not filled with birds, and kangaroos and camels lazily grazed near the waterholes. At lunchtime, I headed for the homestead bar, where I was joined again by Dorothy. Over lunch, we continued our morning conversation, lingering over tea once the meal was finished. It may not seem that I’m staying wildly busy here, but it’s nice to slow down for a bit–and slowing down suits the place. One finds it hard to rush in the land of no time. But, eventually, we did part company, and I set off to explore a bit more. I had picked up a walking map of the area at the office, and it advised that one take water if out hiking for the day. It also instructed hikers to let the office know where one was heading–just to be safe. So I stopped by the office and told them that I’d be traveling in the direction of a couple of rock formations noted on their map. I then picked up my canteen, filled it, and took off on a long hike. Alec has had quite an astonishing life. He was taken from his Aboriginal mother when he was age 2. (It was believed at the time that half-white children should be brought up as whites.) He was raised in a camp up north, until the Japanese started bombing it and everyone was evacuated. He left school at a fairly young age to become a droving cook (the cook on a cattle drive–Australian cowboys are generally known as drovers and the moving of cattle was droving). He’s a big man, well over 6 feet, and powerful, so to earn additional money, he began boxing, and he became the number one contender for the Australian heavyweight title. A half brother in Alice Springs read about him and contacted him, to let him know he had family in the area. He was 37 when he finally met his mother. Sadly, se died soon after. Alec went on to build a good life. He has won awards as a gardener, and he has three sons who are top soccer players in Alice Springs. Now, he’s happy here at Ross River Homestead, teaching bush cooking and boomerang throwing, telling tales at night in the rustic lounge, and pretty much making sure things go well and everyone is getting the most out of their time here. Just guessing, but I can’t help but think that the strong sense of family among those who work here at Ross River would appeal to the little boy who grew alone. I delighted in the red rocks and red earth, trees and grasses and kangaroos. I wandered near riverbeds that were lined by river red gums and, on the whole, dry, but not always, and waterholes were always a good place for birds and animals. 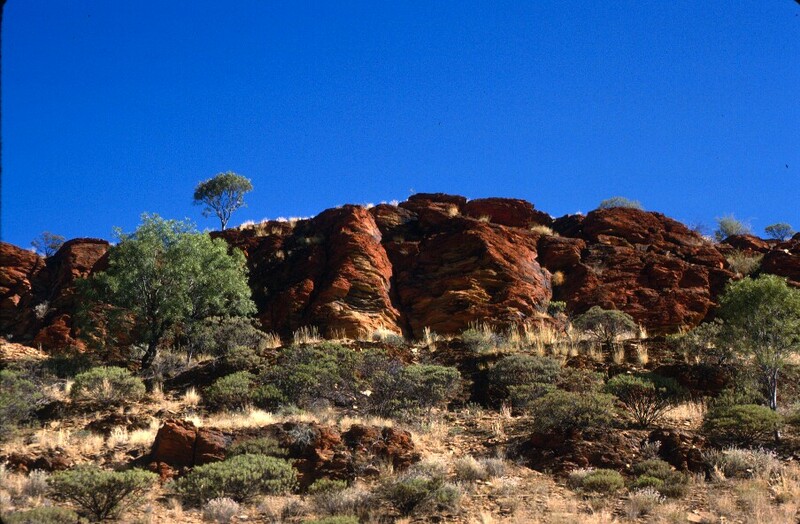 Strolling between hills, I rejoiced to see the ghost gums dotting ragged hillsides, their white trunks standing out so distinctly against the red rocks and brilliant blue sky. 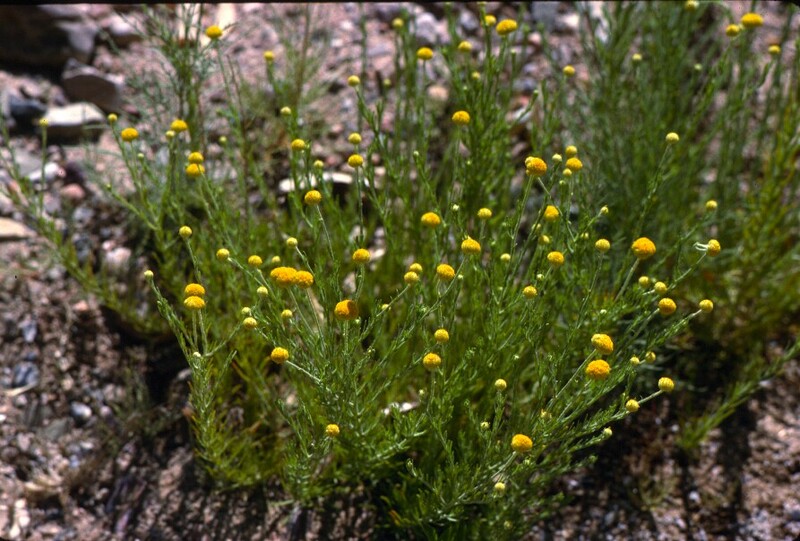 Wildflowers dotted the red earth in many places. It was all so beautiful. At one spot, I came across the remains of a small stream, with little left to show what its extent must have been in wetter weather other than the sculpted “waves” in the sand that showed the patterns of the water that passed through at some point. My eye was caught by a glimmer at the bottom of several of the little dips in the patterned sand, and I scooped a bit up and folded it into a bit of paper, so I could get it identified later. I had assumed perhaps a bit of pyrite, or “fool’s gold,” but Jeff assured me it was real gold. However, he explained that it was so fine and so spread out that one would need to vacuum up the entire desert to collect enough to make even a few dollars. Sigh. Still, it was fun to have, so I folded my tiny bit of red dust back into the piece of paper with which I’d retrieved it, and tucked it into the pocket of my suitcase. To me, the red dirt was more valuable than gold anyway. As evening approached, I headed for the dining room of the wonderful, old, wood-beamed homestead building. 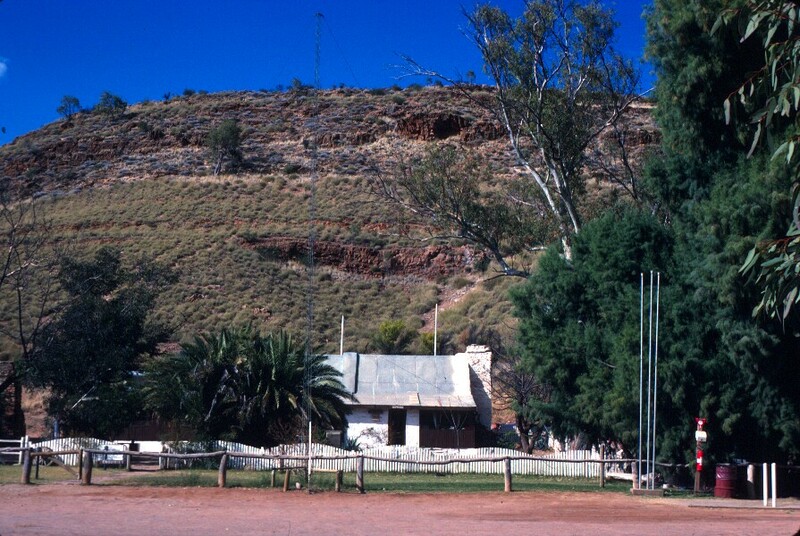 The homestead was settled in the 1890s, and this building dates to that period. It has, of course, been updated a bit, with electric lights and running water, but it is otherwise still beautifully preserved and evocative of a different time. Still, there is talk of further updating the homestead, perhaps not this building but everything else, making it more of a resort, adding facilities that will delight the teens I heard moaning that there was “nothing to do here.” Pity one can’t make people understand how worthwhile it is to simply reconnect with nature and its beauty. Sigh. Dennis, an Irish lad I met on the bus in from Alice Springs this morning, joined me for dinner, which added lively conversation to a pleasant meal. I had kangaroo as an entrée (worth noting for U.S. readers, in much of the world, including Australia, an entrée is, as the name truly suggests, a way of “entering” the meal—i.e., an appetizer—then what Americans call an entrée is called your main course, or just main). It was marinated in wine and ginger, so I couldn’t really tell it from nice beef—which probably helped. But I had to try it. For my main, I had grilled barramundi, the splendidly meat, white-fleshed fish to which I’d been introduced on my first trip downunder. It was fabulous. For dessert, one could hardly have anything more classically Australian than pavlova—also yummy. I awoke well before dawn to the singing of birds. The room was warm, but when I stepped outside, the air was a sweet, gentle cool that never seems to exist any time other than dawn. I packed quickly, in preparation for my departure, then glanced at my watch and got a shock. I’d set my watch back the 1/2 hour for the Centre’s time zone, but not my travel alarm. No wonder it was still so dark out. Well, better early than late. 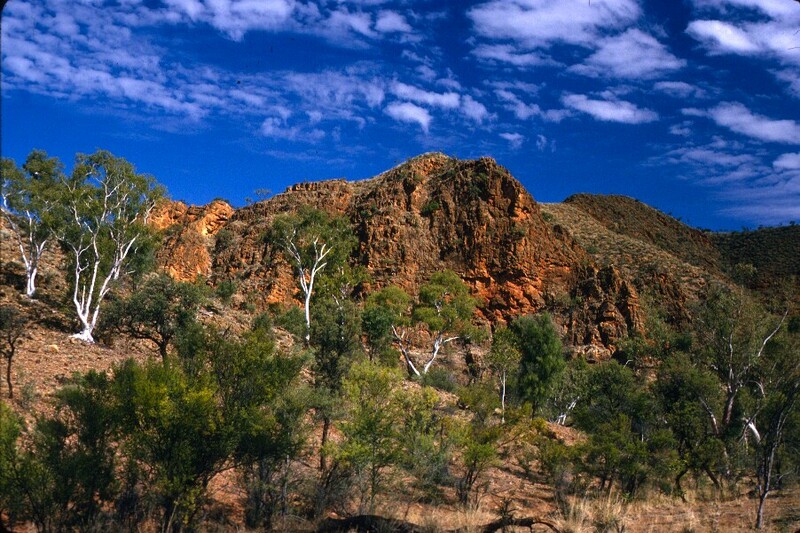 Then out the door and out of Alice Springs, on my way to Ross River Homestead, in the East MacDonnell Ranges–new territory for me, as I’ve previously only been in the West MacDonnells. I was pleased that not all the road was sealed. As I noted in my book, a sealed road may be easier to drive, but an unsealed road seems to better suit this place–rougher and more natural. We drove for about 45 minutes, out along the dry Ross River, with the spinifex, desert oaks, gum trees, and mulgas all around us, and the ragged, red mountains rising up behind. We passed a camel-crossing road sign and several dry creek beds, and then finally pulled in at the Ross River Homestead. The only sounds are the wind in the massive desert oaks around the homestead and the cries of the noisy minas and galahs. The hills rise around us, and the fragrance of the bush fills my nostrils and my heart. Kangaroos and camels are about, the sun is shining, and I could stay here forever. 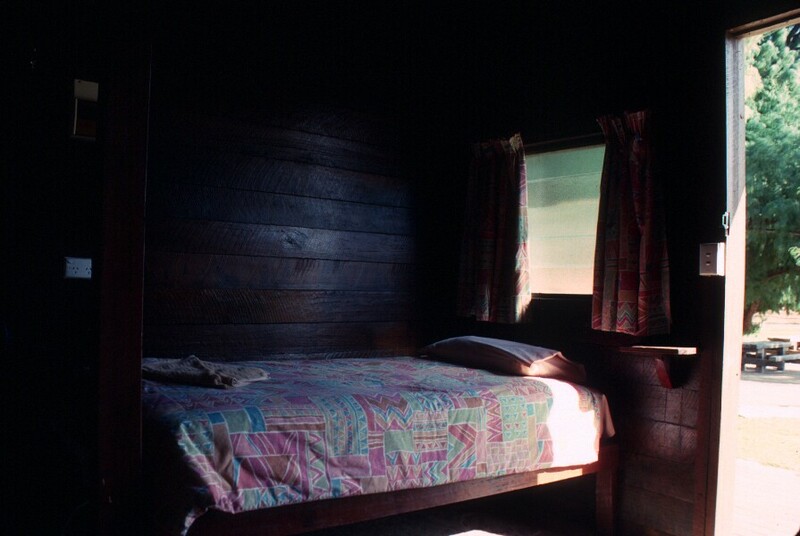 The cabins are wonderful: all wood, with stone floors. They look rather plain from the outside, but are really charming inside. I was given a little tour and introduced to the staff: Burt, Alec, and Jeff, who is the manager, and was then directed to a damper-making lesson given by Alec. 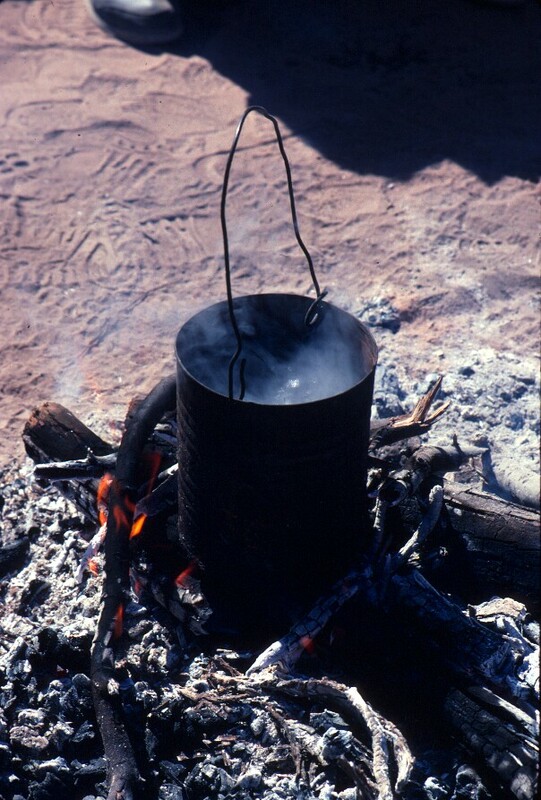 Once the damper was made, we enjoyed billy tea and damper around the fire. In any other setting, this might seem touristy, but here, it’s simply perfect. This was followed by whip-cracking and boomerang throwing lessons. After that, we were on our own. I hiked and photographed till lunch, and then I hiked and photographed until 4:30. The bird life is unbelievable around here: majestic wedge-tailed eagles, tufted pigeons, pied butcherbirds, noisy minas, ruby-breasted mistletoe birds, pink and gray galahs, and splendid, bright green parrots that Jeff, the manager, later told me were Port Lincoln parrots. There were many others I didn’t know, as well. Apparently, the northern and southern bird habitats overlap here, so there are more birds than one might reasonably expect to find. I went for a walk along the Todd River, to just look at the Alice, and to watch the gorgeous sunset. Noisy birds were everywhere. 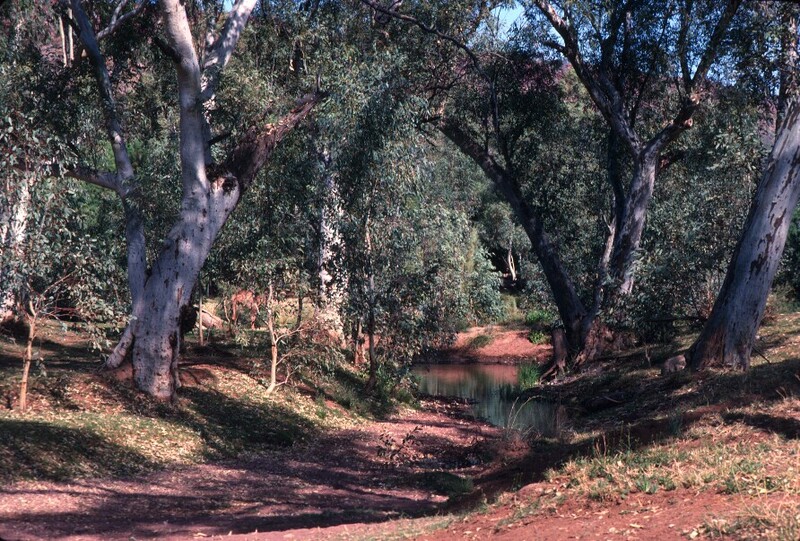 The watercourse was lined with river red gums. It was wonderful. The barbecue was at 8 o’clock, and the food was abundant. They offered classic Aussie barbecue fare: spaghetti, salad, grilled onions, grilled potatoes, and tough steak, along with one free glass of wine. Not bad for $6.50. They did have kangaroo, as promised, but the cook said you had to order it ahead of time. I was actually rather relieved. I’m fond of kangaroos, and I hadn’t quite gotten my head around the idea of eating one. The crowd was fun, but very young, and almost all British, including my students from the bus ride. We all shared tales of our various travels. One young man spoke enthusiastically of the adrenaline rush he’d gotten from bungee jumping. I suggested that if he liked adrenaline, he might enjoy the riding trip I made through the mountains, during my first visit to Australia. I described some of the adventure, and the young man, wide-eyed, exclaimed, “But that’s real danger.” I don’t think I let it register on my face, but his reaction surprised and amused me. “So you only want artificial danger?” I queried. “Well, yeah,” he said with emphasis and incredulity that I even needed to ask. The two thoughts that flashed through my mind were that he seemed mighty young to be aware of his mortality and that it seemed like a real waste of adrenaline, using it for something not real. Storytelling wound down after about an hour, and the young men’s attention shifted from me to the slender, pretty, mostly blond young women who were clearly wondering why a considerably older woman was of such interest. It made me chuckle, but it also gave me a chance to gracefully depart. The bus for Ross River will be picking me up at 7:30 a.m., and a good night’s sleep is always a good thing before moving on.